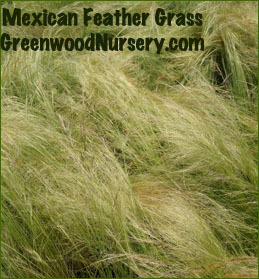 Buy Mexican Feather Grass Plants Online here at Greenwood Nursery. Mexican Feather Grass is a light feathery ornamental grass that moves every so gracefully with each breeze. When planted in groups of 5 or more, your Mexican Feather Grass plants will create a beautiful airy mass. Mexican Feather Grass, Nassella tenuissima, requires occasional watering until established which is generally one year. The green color variations soften any garden or landscape areas. Brown plumes appear on the Mexican Feather Grass during the summer months. Mexican Feather Grass is a North American Native grass that is low maintenance. Prune dead growth in early spring. Check out our Pony Tails Nassella Mexican Feather Grass. Plants in photo are plants shown during the growing season.